Ross Brown lives in Yorkshire. His passion for photography grew out of a love of exploring the hills, moors and dales of the Lake District, Yorkshire and Scotland. Initially he spent a number of years using a large format camera, learning the importance of a meticulous workflow and balanced composition. 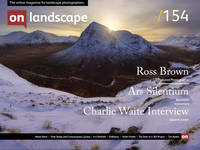 Ross is a regular contributor to the John Muir Trust Wild Nature Diary and Calendar, and exhibits his work in Yorkshire. Would you like to tell readers a little about yourself - your education, early interests and career? My experience of the landscape goes back to being a child when I often went on holiday to different parts of the UK. My parents were keen on walking and we spent holidays exploring the coastal paths of Devon and Cornwall or walking in the dales and hills of the Peak District, Yorkshire Dales or the Lake District. At the age of 18, I went to University in Edinburgh to study Medicine and during my time there I was introduced to the magnificent landscape of the Scottish Highlands. I explored this with friends, wild-camping at Camasunary on the Isle of Skye, walking the Lairig Ghru path, or climbing Munros in the Cairngorms. I have eventually settled in Yorkshire working as a doctor and have lived here for nearly 20 years.